Shell in the Arctic: Shell abandons Arctic drilling citing regulatory and cost concerns. 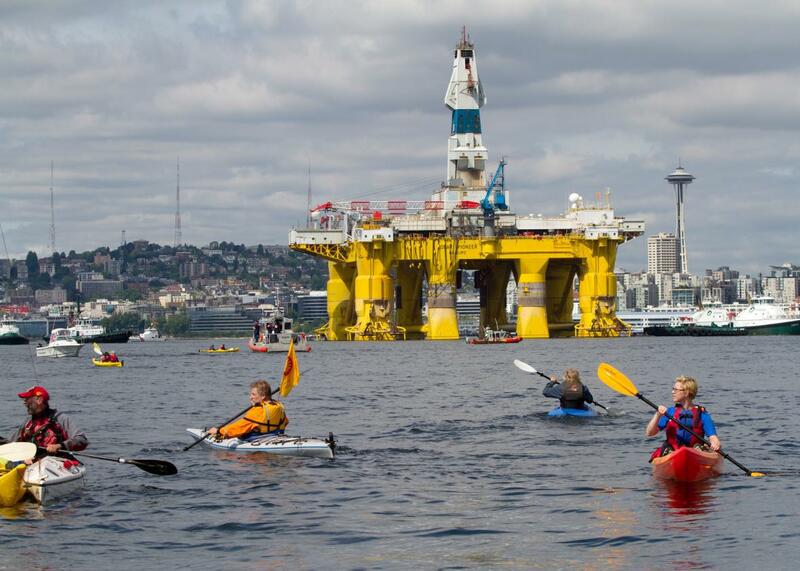 Environmental activists in kayaks protested the arrival of the Polar Pioneer, an oil drilling rig owned by Shell Oil, on May 14, 2015, in Seattle. The primary reason Shell gave for its decision was that it just didn’t find enough oil. Shell also cited an “unpredictable federal regulatory environment”—likely a nod to Democratic presidential candidate Hillary Clinton’s recent decision to break with the Obama administration and oppose the project—as well as high costs associated with the drilling. Shell has spent $7 billion and eight years working toward developing offshore oil in the Arctic. According to an industry analyst who spoke to the Wall Street Journal, Shell’s investors should be pleased with the economics of the decision to stop the project. Even activists were worried about the money: Chief among concerns of environmentalists, in addition to the additional greenhouse gases, was that a large oil spill in the sensitive Arctic would be particularly difficult to clean up—and would likely come with a huge price tag. Shell says its exploratory well in the Chukchi Sea—80 miles off Alaska’s northwest coast—will now be “sealed and abandoned in accordance with U.S. regulations.” But that doesn’t mean Shell’s quixotic dreams of Arctic oil are over yet. “Shell continues to see important exploration potential in the basin, and the area is likely to ultimately be of strategic importance to Alaska and the US,” said Marvin Odum, director of Shell Upstream Americas in a statement. But probably not for quite a while. The head of Shell’s Arctic division, Ann Pickard, told the Wall Street Journal earlier this year that if its efforts in the Chukchi failed “for whatever reason”—and they now clearly have—that it would likely be 25 years before any other company, Shell included, would try again. By that time, climate change may have become such a pressing concern that the Arctic would be seen as off limits. A groundbreaking study earlier this year calculated that the “economically optimal” path for reducing emissions requires no further development of fossil fuels in the Arctic. The Shell news is the second major victory for global warming campaigners in less than a week, during a critical period in advance of global climate negotiations in Paris later this year. On Friday, China announced it would start a nationwide cap-and-trade program to reduce carbon dioxide emissions, which will be the world’s largest such program.